Nuplex Industries is an international leading supplier of innovative resins used in protective coatings for a wide range of applications including architectural, domestic appliance and automotive uses. London South Bank University (LSBU) originally approached Nuplex to see if there were any areas where the University could help the company address issues related to final product quality and to optimise the manufacturing processes by improving equipment performance. LSBU’s Knowledge Exchange Institute suggested a 12 week consultancy project led by recent graduate Renzo Huaynates. Renzo, a BEng (Hons) Chemical and Process Engineering graduate, led the research and was supervised by Metkel Yebiyo, Research Fellow in Refrigeration and Air Conditioning, and Dr Issa Chaer, Reader and Course Director in the School of the Built Environment and Architecture. The project involved the analysis of Nuplex’s resins manufacturing process, using LSBU’s top-class equipment, such as thermal imaging cameras and velocity meters. Renzo and his team were able to look at our process from a new perspective. They were able to validate some of our own thinking, and introduce new ideas. We very quickly became one team as Nuplex staff and LSBU staff worked together to solve the same challenges. The project culminated in Renzo producing a report suggesting short and long term measures which could be implemented to improve both the production efficiency and the product presentation quality. “I learnt how to approach a problem in a methodical manner and developed my analytical skills. I also learnt about the key role teamwork plays in the success of a company,” commented Renzo. Renzo presented his final work to Nuplex’s European Management team. Not only has Nuplex started implementing Renzo’s suggestions, but the company has formally employed him as a full-time Process Engineer. “I am grateful to Nuplex and LSBU for giving me the chance to showcase my skills repertoire and convince them to give me a permanent position,” said Renzo. “This project demonstrates that our students are professional, effective and highly capable of delivering in the workplace, both theoretically and practically. Renzo’s work is a great result for LSBU and a fantastic resource for Nuplex,” said Dr Chaer. 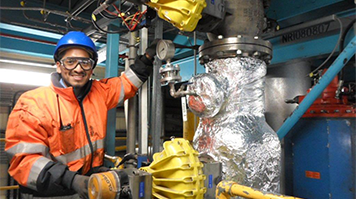 “The experience has benefitted both parties, and I am confident that having Renzo on the Nuplex staff will be an asset to our Engineering Group,” said Paul. Get more information on LSBU’s Knowledge Exchange Institute, which connects businesses and organisations with the University’s expertise and skills.